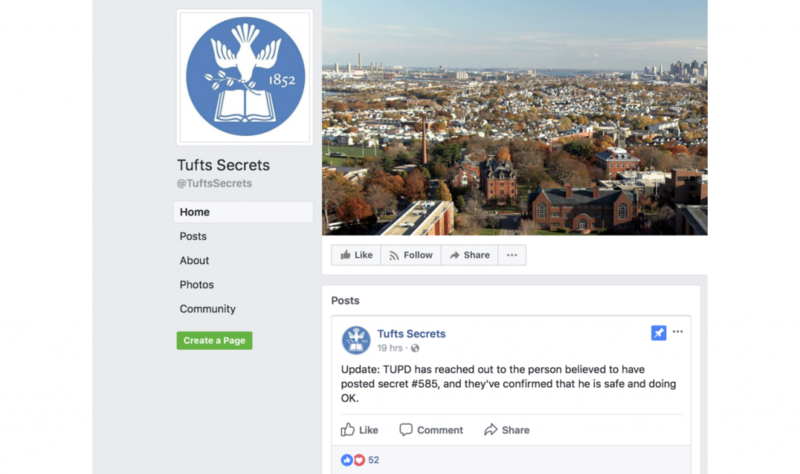 The Tufts Secrets Facebook page, pictured here, allows Tufts students to post anonymously, an ability that has led some to debate the usefulness and helpfulness of this page. From ASKfm to Yik Yak, anonymous sharing platforms seem to inevitably descend into baiting, bullying and bitterness. Nevertheless, they continue to be reimagined and reintroduced, aiming to create positive spaces for unfiltered exchanges. “Tufts Secrets,” a Facebook page created this fall by an incoming graduate student, proves little different. The page’s goal is to make people feel they are part of a tangible community and find people they could relate to, according to its creator who requested to remain anonymous. Despite well-meaning intentions, the page’s atmosphere quickly turned sour. The page administrator tracked the descent. James Boehme, a first-year who follows the page, weighed in on its commitment to free speech. The administrator defended his decision to post every secret received. The post faced immediate opposition from commenters with varying intents. Boehme, who commented to reason with the poster, was eager to respond to the post. Others viewed debating with the poster as futile. Edwin Jain, a junior who commented with specific objections, felt that his comments were more for the ambivalent readers of the post. On the differing comments, the administrator thought that impactful ways to respond to disquieting posts exist. In response, Ria Mazumdar, who commented a simple denunciation, explained her thoughts on why discourse on the page would be ineffective. Jain, however, saw anonymity as beside the point. Boehme promoted in-person dialogue as a way to hold people accountable for their opinions and stated that Tufts Secrets‘ anonymity didn’t offer a productive conversation. However, he argued, if better utilized, anonymity could be helpful. “Someone who is LGBTQIA needing a safe space for coming out — that could be a good way as a first step to have that anonymity, just post it and say, ‘This is what I feel,’” he said. In spite of potential page benefits, Mazumdar does not believe posts like the secret in question bring about healthy discussion. “I don’t think the existence of the page in general contributes any productive discourse whatsoever,” she said. Boehme saw the page as a microcosm of campus. The administrator, however, urged perspective. To refocus the page, the administrator instituted a theme week. Each day he accepted secrets only on a specific topic, like sadness, happiness or anecdotes. Jain viewed the theme week as attempting to ignore deeper problems. UPDATE: This article has been updated to clarify Ria Mazumdar’s comments on whether certain Tufts Secrets posts create healthy discourse.